Tyler Joseph and Josh Dun are men of many talents and perhaps one of their best is putting on a show. 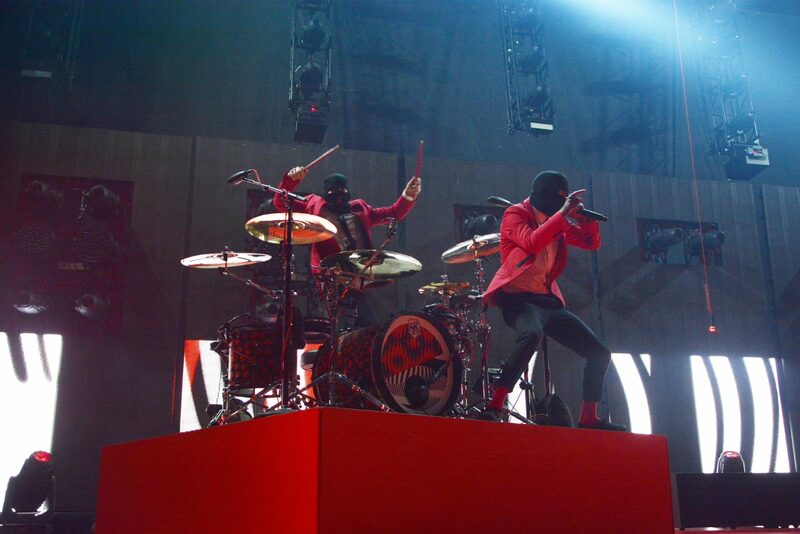 The duo, known as Twenty One Pilots, took the stage at the KFC Yum! Center March 5. Alternative band Judah and the Lion and rapper Jon Bellion opened the show with an array of guitar solos, head-banging and song mash-ups. Bellion sang his top 10 hit “All Time Low” minutes before leaving the stage for the headliners. Since the band’s 2009 formation, Twenty One Pilots has reached fame and success with a number of singles released and four albums and EPs. Their Louisville show is the last arena U.S. show in their Emotional Roadshow Tour. The tour began last year and will end in June at the Firefly Music Festival. Throughout the show, the LED screens behind them projected animations of various art centered around the “Blurryface” album. The sporadic and exhilarating light show was overwhelming but only enhanced the already exciting show. About halfway through, the duo moved to the center stage in the venue’s pit. They slowed it down, singing a heart-wrenching performance of “Cancer” and a medley of songs from previous albums. Later, the group invited the opening acts back on the front stage with them to sing covers of songs from The Black Eyed Peas and Blackstreet. As the concert came to a close, Twenty One Pilots performed their massive hits “Stressed Out,” “Tear In My Heart” and “Car Radio,” causing a final stir of pandemonium in an audience that wasn’t quite ready to go home. After a show with a mix of songs from “Vessels” and “Blurryface,” it seemed like the show was over too soon. Twenty One Pilots performed a concert with passion and genuine love for the crowd. The Ohio natives described Louisville as feeling just like home and said the city always welcomes them with open arms. As a flood of red confetti fell from the arena ceiling, closing out the dynamic and powerful concert for good, Dun and Joseph stood side by side at center stage thanking their fans and promising to return. Twenty One Pilots reveals themselves on stage after a curtain with their album cover rises. Tyler Joseph hangs with the crowd. The show sold out over 14,000 seats.